I’ve been fortunate because I’ve had the opportunity to fish many places from Ontario through the Deep South. As a young man, I learned to fish in West Virginia, searching for rainbow, brown and brook trout in the many ponds and streams across the state. Soon after I began my career in the glass industry I moved to Tennessee, New Jersey, Georgia, and back to Tennessee. Each move offered new fishing opportunities that introduced me to new kinds of fish and ways to catch them and I made many new friends along the way who taught me how to catch fish in their home waters. Now I live in northeast Tennessee, in Kingsport, with my wife Tammie. It must have been fate that brought me to Tennessee because I met my wife and learned this area offers the most diverse fishing opportunities of anywhere I’ve lived. Above average to exceptional fishing is available for many popular game fish including black bass, striped and hybrid bass, rainbow and brown trout, walleye, catfish and others in the many lakes, rivers and streams across the region. There are so many angling choices locally, I sometimes have a hard time deciding when and where to go fishing. Much of what I learned about fish and fishing has been captured in my book, The Weekend Angler’s Guide To Good Fishing. If you’d like to read it and share in my experiences, click on the photo of the book to go to Amazon.com where you can preview some pages or order a hard copy or Kindle version. Whether you’re an experienced angler or someone new to our sport, I’m sure you’ll find things in my book that will help you catch more fish. I hope you enjoy reading it as much as I enjoyed learning the things described. Of the many places I’ve fished, there’s one thing I found they have in common. In every state or province on every body of water there are other anglers like us who want to learn more about fishing. Much of what I’ve learned was through trial and error. Some was the result of applying past experiences to new places or species of fish; others from applying something I’ve read or seen on television to a similar situation. But many things I’ve learned have come from other anglers. I believe if you listen closely and keep an open mind when talking with others there is much you can learn. Show respect, question or offer suggestions with courtesy and you’ll make many new angling friends and learn much more about fishing. So if you have suggestions that will help me become a more successful angler, please share your knowledge. Comments or suggestions are always welcome. I hope you’ll continue to visit me here as I share my experiences in new places and explore other angling opportunities. Friend me on Facebook and you can see photographs of many of the fish I catch and post your favorites for all of us to enjoy. If the information you find here or in my book helps you catch more fish, I hope you’ll tell your friends and family so they can join us. Be safe and great fishing! This is Mike. Coming into Knoxville this week end to help keep my granddaughter. Where do I need to go that can wade and fish for small mouth. I’ve been looking, sounds like the Holstad is pretty good. How far up do I need to go from knoxville before I can find a spot to wade and have good chance of catching some. There are two good rivers you can explore on the northeast side of Knoxville. The Holston and the French Broad come together there to form the Tennessee River. I’ve never fished the Holston that far down, or the French Broad, but I do know both offer good fishing for smallmouth bass until you get close to upstream dams and water temperature drops too low. If I were traveling out of Knoxville, I would focus on the French Broad River first above Fort Loudon Lake all the way up to where the Little Pigeon River flows in, north of Sevierville. The Pigeon has a reputation of producing some fine smallmouths this time of year so check it as well. And of course, access will be the issue if you’re wade-fishing. Sevier and Knox County maps will show where roads move close along the French Broad River and provide access or you can use Google Earth or another net mapping resource to pinpoint possible access points. If a drive up the French Broad doesn’t provide what you’re looking for, do the same on the Holston. Knox, Grainger and Jefferson County maps will show the river all the way to Cherokee Lake Dam. The section of the Holston River I routinely fish for smallmouths is from the headwaters of Cherokee Lake northeast to just below Ft. Patrick Henry Dam in Kingsport. I’ve explored many river systems the way I described and always enjoyed the adventure of finding new places to fish. Best of luck. 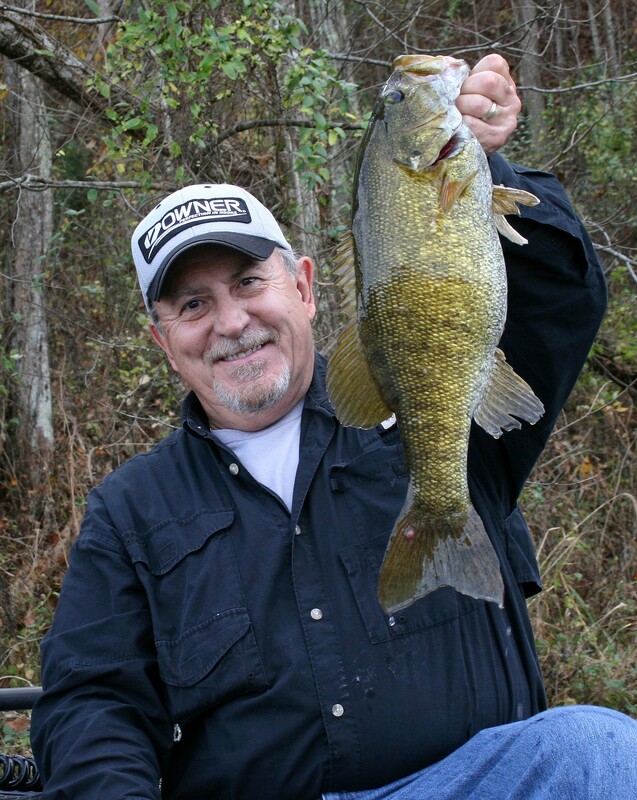 I hope you find some great smallmouth fishing and have them all to yourself! My name is Damion Huntoon and I’m a writer for CityView magazine in Knoxville, TN. We’re currently working on an article on fishing in East Tennessee and I was wondering if you could provide some info on some tips for the beginning angler, or also some of your favorite hot spots around East Tennessee. I’d be glad to provide some tips and guidance for your readers. I’ll be fishing most of today but will be at my desk by tomorrow and will give you a call. Look forward to talking with you and thank you for the opportunity. Kieth. Steve here.i want to learn to catch the spring walleye wataga lake.. I here they run up the two rivers…got any tips for me to look for and what to use for bait? There a blast! I did manage to land a couple at night in late fall. Steve, the time is right for spring walleye fishing on southern highland reservoirs like Watauga Lake. If you want to learn the lake and how to catch ‘eyes during spring, it’s time to go now and will only get better in coming weeks. There’s a feature story in my book about fishing for spring walleyes in Watauga Lake that will answer all your questions and give you the information needed to find and catch them including where to fish, recommended rod and line choices, methods of presentation and more. But let me add some tips that will help you further regarding lure selection. The primary lures described in my book include Rebel Spoonbill deep-diving minnow lures in jointed and straight models and three-inch Storm swimbaits. The best local source for the Rebel Spoonbills, and current lake fishing information, is at Fish Springs Marina off Highway 321 along the southern side of Watauga Lake. Rebel Spoonbills are still top choices in the sizes and colors described in my book but some have been discontinued and there are other similar lures that are equally effective and easier to find. Rapala Jointed Deep Husky Jerks and Down Deep Husky Jerks, Bomber Deep Long A’s and others offer nearly identical profiles, actions and operating depths and those made by Bass Pro shops, Lucky Craft and others are more good substitutes. Also, Rapala Shad Raps, Berkley Flicker Shads and others with the shad body shape in similar sizes and colors have won many walleye tournaments on Watauga Lake. But the availability of swimbaits in best sizes and colors has exploded in recent years and some of these incredibly effective baits should be included in your walleye fishing tool box. If you need help choosing a few of each type lure, ask for me in the fishing department at the new Bass Pro Shops store in Bristol TN and I’ll gladly to help you choose a base selection that will get you started on highland reservoir walleye fishing. Thank you for asking and good luck on your new fishing adventure. We are a non-profit organization called Zane Grey’s West Society. Early in Zane’s life, he did a lot of largemouth bass fishing in Ohio and Pennsylvania and wrote stories about it. We are putting together a non-profit book of his stories for young people and would like permission to use one of the pictures from your page or perhaps you could send us one. There’s one of your hand holding up a bass down in the water that would be perfect. We would need your permission to use the photo and would, of course, give you credit. Your picture is color, but we would use it black and white. Thanks! There’s nothing better than a picture of a big old largemouth bass. Thank you very much for asking and I’d be honored to contribute a photo for your new book. Contact me at theweekendangler1@gmail.com and I’ll send you what you need. Best of luck on the new book! I was the guy from Ohio we talked about the pond I stocked. The top water lure hasn’t produced a bass yet, but I think they are eating so well, it will in time. The action is very good, the bluegill keep hitting it, so I know it won’t be long for the bass. Thanks again it was great talking to you. I remember you well Chris and thanks for the note. Good luck with your pond and growing some big bass. I hope you’re able to stop by again some time and give me an update. I enjoyed our conversation very much. All the best! Hey Keith, I meet you under the bridge fishing. Lol You look legit! I caught 5 nice trout this morning at my honey holes. They are marinating for smoker. I will check back. Check out my buddies from Florida, Stinky Bait! They work. Great to hear from you Mark and glad you had a successful outing. I’ll check out your friends in Florida.